Here’s another classic Disney exhibit, like yesterday’s Country Bear Jamboree, introduced in 1971, with the opening of Disney World. 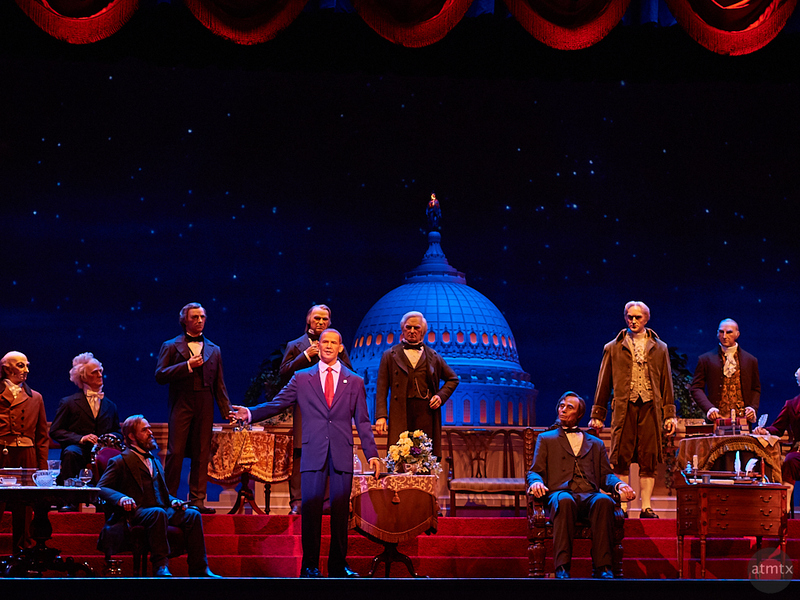 I was expecting a nostalgic trip back to my childhood, when I originally saw the animatronic presidents. However, unlike the country bears, this presidential exhibit was fully revamped and made modern. I was pleasantly surprised. A slick wide-screen movie, narrated by Morgan Freeman starts the show, before the entire cast of U.S. Presidents are introduced. President Obama gives a rousing speech accompanied by patriotic songs and a lot of flag waving. While fully modern, there’s still a nod to the past and vague feeling of something not of this time — originating in a more innocent, less skeptical age. It has solemnity, a gravitas, which is lacking in this age. Disney pulls it off well, with the theater wrapped in colonial architecture, resembling Independence Hall in Philadelphia. There’s a certain patriotic pride that wells up, looking at 228 years of presidential history. A grand experiment in this thing called Democracy.